Home / Refer a Friend to QuiBids for Free Bids! Refer a Friend to QuiBids for Free Bids! UPDATE (11-26-2014): The info below is no longer relevant. Now there are NEW ways to refer your friends to QuiBids. Go here to learn more. Sounds easy, right? Simply type www.QuiBids.com into your browser’s address bar and hit enter. You will be taken to the QuiBids home page. Next, locate the text boxes at the top right of the page. Enter your QuiBids username or email in the first box, and enter your password in the second box, then click the “Login” button. Once you’re in the My QuiBids section, you should see Refer a Friend box on the left side of the page. Click the blue button that says “Refer a Friend!” Refer to the image below. Once you’re on the Refer a Friend section of QuiBids, you’ll notice that their are two ways to refer a friend. If you have your friend(s) name and email, you could simply complete the form on the right side of the page to send your unique reference link in a referral email to your friend. After that – you’re done (no need to proceed to step 3). Now that you have copied your unique reference link, try sharing it with your friends and followers via social networking sites like Facebook, Twitter, Google+, or any other networks/forums that you’re a part of. When you share the link, try to include some information about QuiBids so your friends will know what the link is for. You could also talk about some great you have received, or how much fun you’ve had while bidding. The more often your friends see that you’re winning on QuiBids, the more likely they will sign up using your unique reference link, and thus getting those referral bids credited to your account! For every person that signs up using your unique reference link, you will receive 20 Voucher Bids! 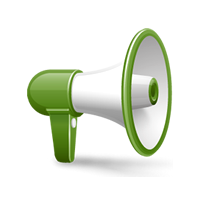 Once you refer 3 friends, you’ll also receive the Top Recruiter Badge and 20 FREE bids! That’s it! 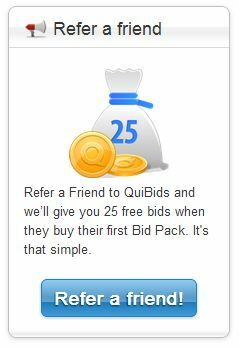 Now let’s see how many voucher bids you can receive by referring friends to QuiBids! How Do You Celebrate Your QuiBids Win?